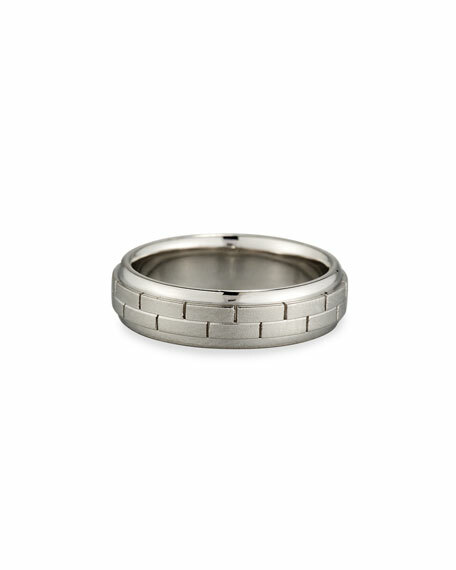 Gents brick pattern platinum wedding band ring by Eli. For a quarter-century, Eli Jewels has dazzled its audience with unique collections that blend contemporary designs with ancient beauty, and classic feminine looks with the bold feel of gold and platinum. Colorful precious gemstones and natural pearls help define the signature look. John Hardy men's ring from the Classic Chain Collection. Polished 18-karat yellow gold with carved chain motif. Approx. 0.3"W (8mm).